Developed a code to calculate the electron tunneling pathways at atomic resolution, tunneling matrix elements, and electron transfer rates of long-distance electron tunneling in proteins. The code works in conjunction with Gaussian quantum chemistry package, and can thus be applicable at any computational level including density functional theory. Developed a new methodology for computationally efficient realistic simulation of the anharmonic vibrational dynamics of polyatomic molecules in solution (as an extension of my work in the graduate course in Hiro-o Hamaguchi Group ). 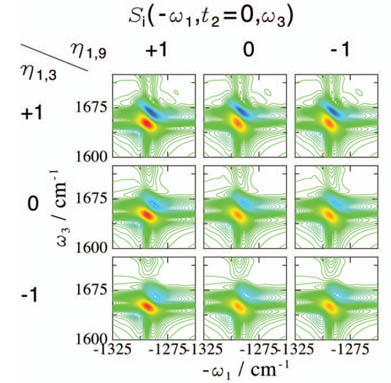 The model can treats vibrational dynamics such as dephasing, population transfer, exciton hopping, and correlated frequency fluctuations of multiple-quanta transitions of molecules as large as proteins based on a QM/MM scheme without repeating quantum mechanical (QM) calculations at each time step. The ab initio anhrmonic multi-dimensional vibrational Hamiltonian of QM regions (vibrational chromophores) is parameterized with respect to the local multipole electric field (denoted as Electronic DFT Maps) . Coulombic interactions between multiple QM regions are expanded in transition multipoles . By combining them with MD trajectories of the whole system and wave-propagation techniques, the vibrational dynamics of the whole system is obtained. The proposed technique is one of the most accurate and has been successfully applied to water (HOD/D2O and pure H2O) and many proteins, in good agreement with experiment. 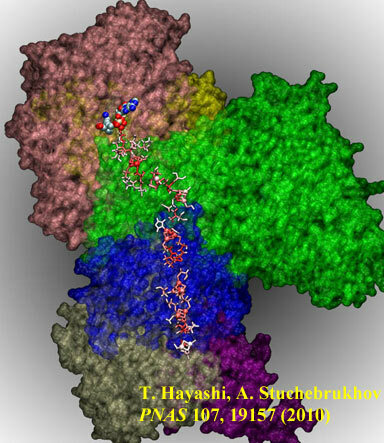 Simulations of the whole four amide vibrational regions (I, II, III and A) of proteins were performed for the first time . Applied the proposed technique to coherent 2-Dimensinal infrared (2DIR) spectrsocopy. 2DIR has been established as a powerful tool to investigate the molecular structure and ultrafast molecular events due to its unique high temporal resolution and multidimensional spectral information, although spectral analysis had been difficult because of the complex nature of the vibrational Hamiltonian. We identified the 2DIR signatures of the extraordinary high anharmonicity of the malonaldehyde (a double-well type intramolecular proteon transfer system) , correlations and excitonic couplings in the hydrogen-bond network of liquid water, correlated hydrogen bond formation at peptide amide bonds , and protein secondary structures. We demonstrated that 2DIR with polarized beams can distinguish multiple secondary structure candidates of a peptide which NMR cannot distinguish.